Year Zero is the fifth studio album by American industrial rock act Nine Inch Nails, released on April 17, 2007, by Interscope Records. Frontman Trent Reznor wrote the album's music and lyrics while touring in support of the group's previous release, With Teeth (2005). In contrast to the introspective style of songwriting Reznor used on previous records, Year Zero is a concept album that criticizes contemporary policies of the United States government by presenting a dystopian vision of the year 2022. The album is part of a larger Year Zero project which includes a remix album, an alternate reality game, and a potential television or film project. The Year Zero alternate reality game expanded upon the album's fictional storyline by using media such as websites, pre-recorded phone messages, and murals. Upon its release in April 2007, Year Zero sold over 187,000 units in its first week, and it reached number two on the Billboard 200 chart. The album also received generally positive reviews, many of which were favorable toward the accompanying alternate reality game. Year Zero produced two singles, "Survivalism" and "Capital G", the latter released as a promotional single. Disputes arose between Reznor and Universal Music Group, parent company of Interscope Records, over the overseas pricing of the album. 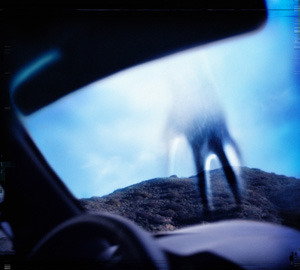 Year Zero was the last Nine Inch Nails studio album released on Interscope. In October 2007, Reznor announced that Nine Inch Nails had fulfilled its contractual commitments to Interscope, effectively ending the band's relationship with the label.